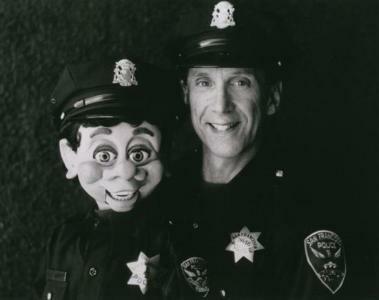 Officer Bob Geary used ventriloquism as a creative form of community policing. 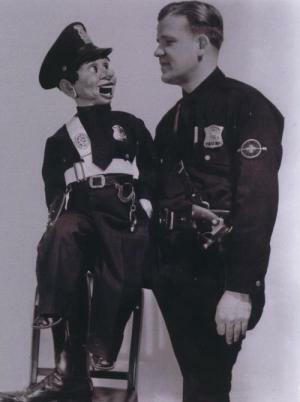 He rode in his marked police unit with his ventriloquist figure, Brendan O’Smarty. Together, they provided a bit of comic relief for weary citizens around his assigned patrols for the San Francisco Police Department. 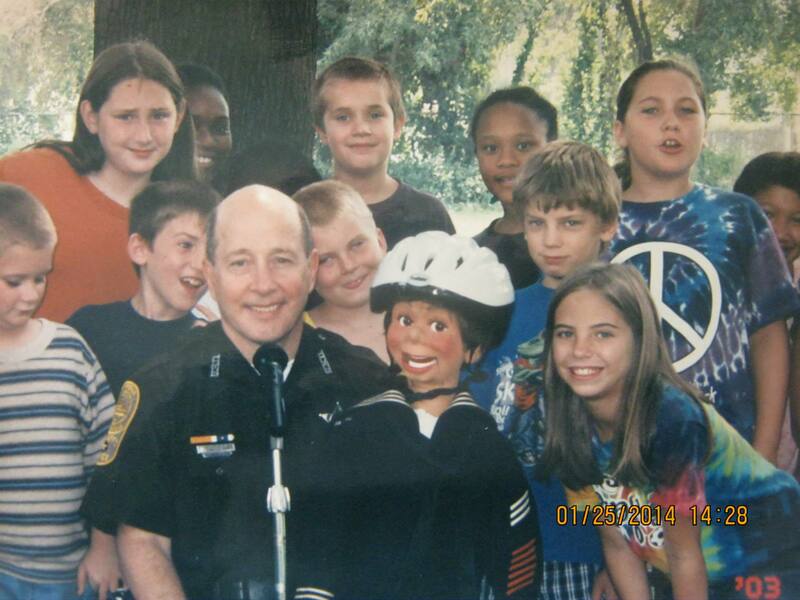 Many people suddenly shed their prejudice of police officers as hard-nosed, insulated Robocops, and realized that they might actually have a sense of humor due to Bob’s creative form of community policing. When he retired from the department, a Wells Faro stagecoach with four horses parked in front of the station, drove him on his last tour of North Beach – that was his beat for so long – accompanied by his partner and alter-ego, Brendan O’Smarty. Mayor Willie Brown, Jr. Declared his retirement day as “Office Geary Day” in San Francisco. Brendan O’Smarty shared in the tribute. Sgt. Wayne Fernelius was appointed to the Detroit Police Department on May 1, 1934, and resigned on July 15, 1947. 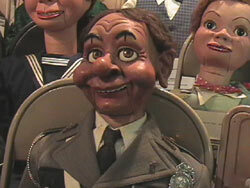 He worked at the Third Precinct. Officer Fernelius was Finnish and also spoke it. 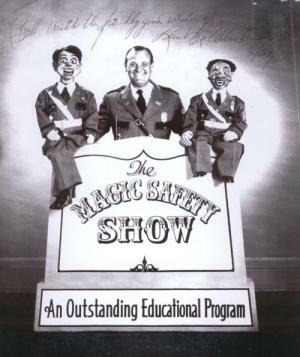 He did safety programs with his ventriloquist figure, Jerry MacSafety. They were sponsored by the Ford Motor Company. He holstered his pistol backwards and wore motorcycle boots on duty. Read “Trivia” section to find more information. 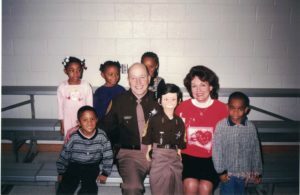 Lee Allen Estes was a Lieutenant with the Kentucky State Police and a Kentucky native himself. 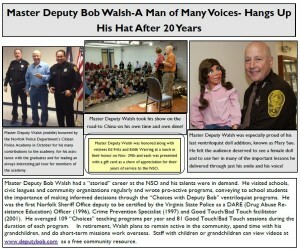 He convinced the State Police of the need to take an educational safety-promotion program into Kentucky schools. 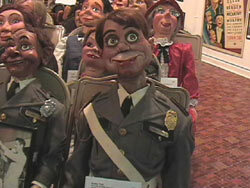 Lee used two McElroy figures: Willie Talk and Kenny Talk. 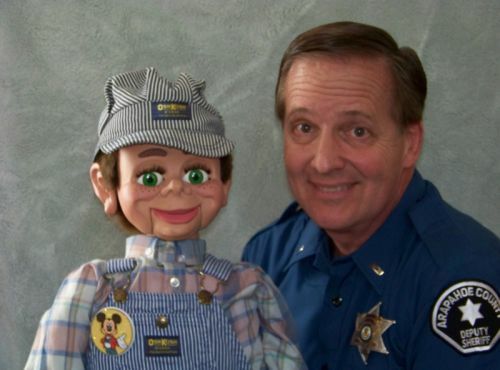 His ventriloquist school shows combined ventriloquism and magic with messages about fire, bicycle and general safety around the home to children. 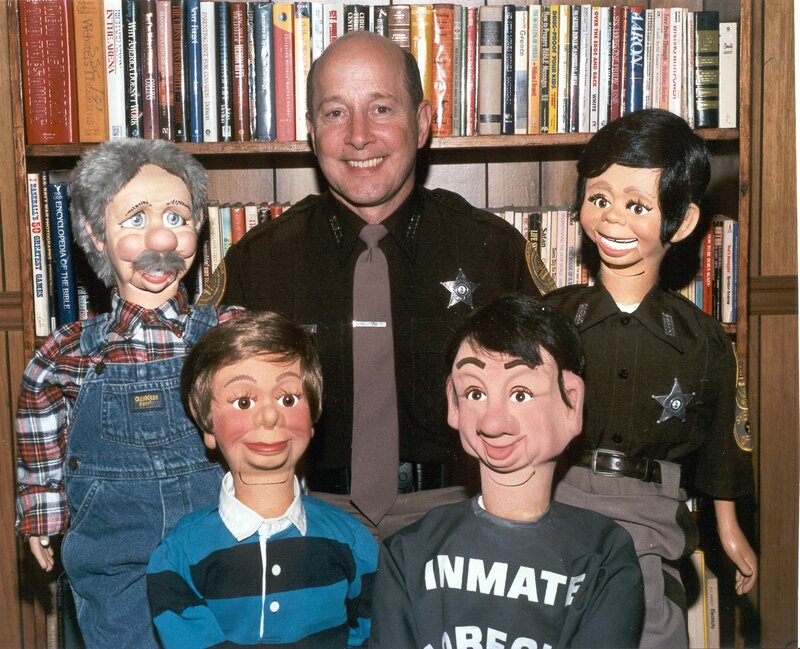 Lt. Estes traveled throughout the state of Kentucky in the 1940s and early 1950s doing his ninety-minute stage shows. 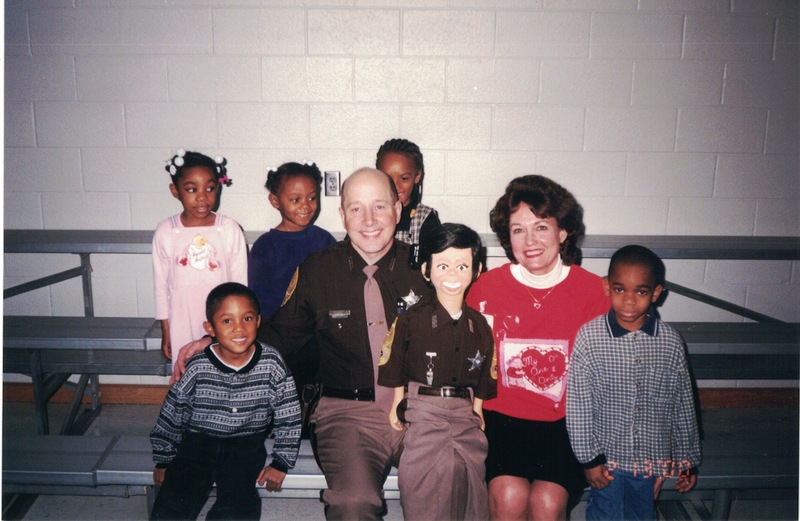 The Kentucky State Police felt the program was such a success that they even bought a special vehicle for Lt. Estes to transport his equipment in order to deliver these programs. 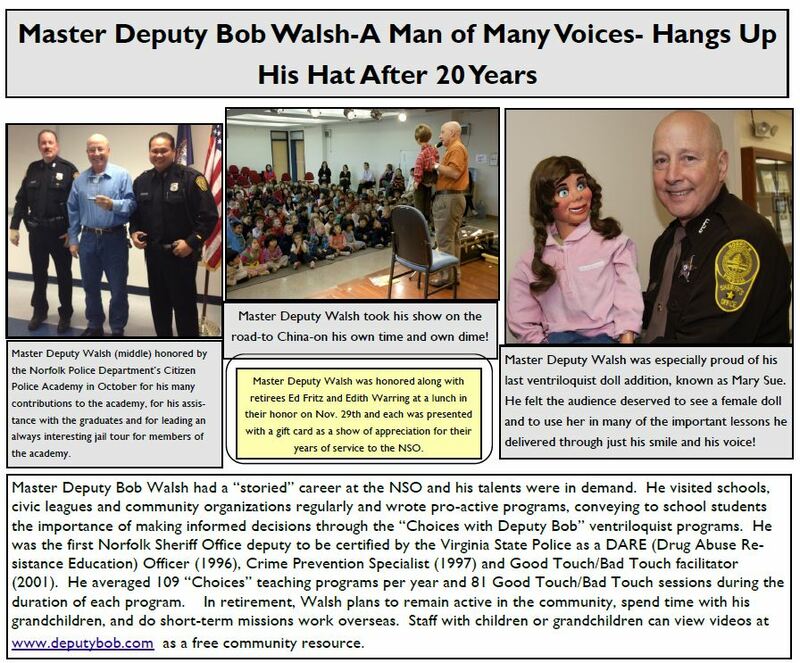 In addition, his department gave him permission to lecture on these topics to other safety-related conventions around the country. 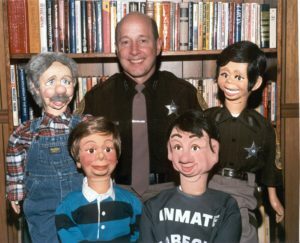 as they now live in Vent Haven Museum in Ft. Mitchell, KY.
Chris Manos of the Arapahoe County Sheriff’s Office performed safety, magic and puppet shows for schools, businesses and the community with his ventriloquist pal “Dusty.” He holds a Master of Arts degree in management from Webster University. 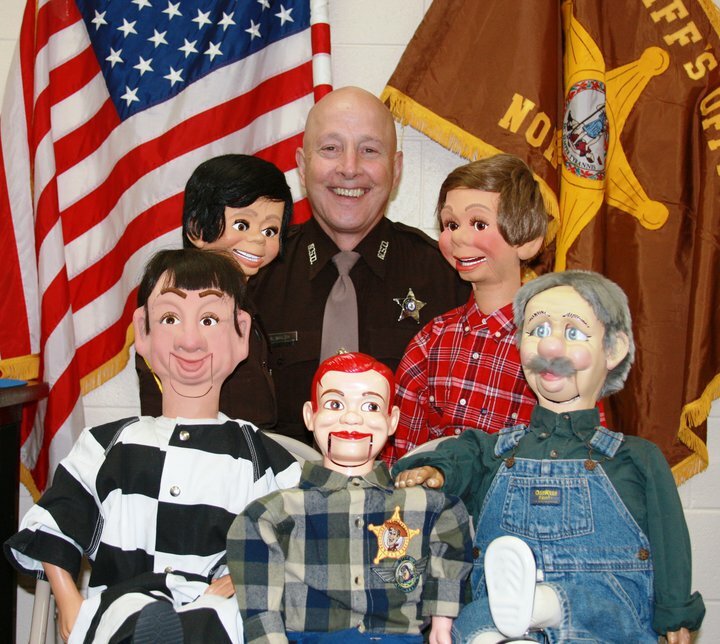 Chris received state, national and international awards for his efforts in the field of magic, puppetry and crime prevention. 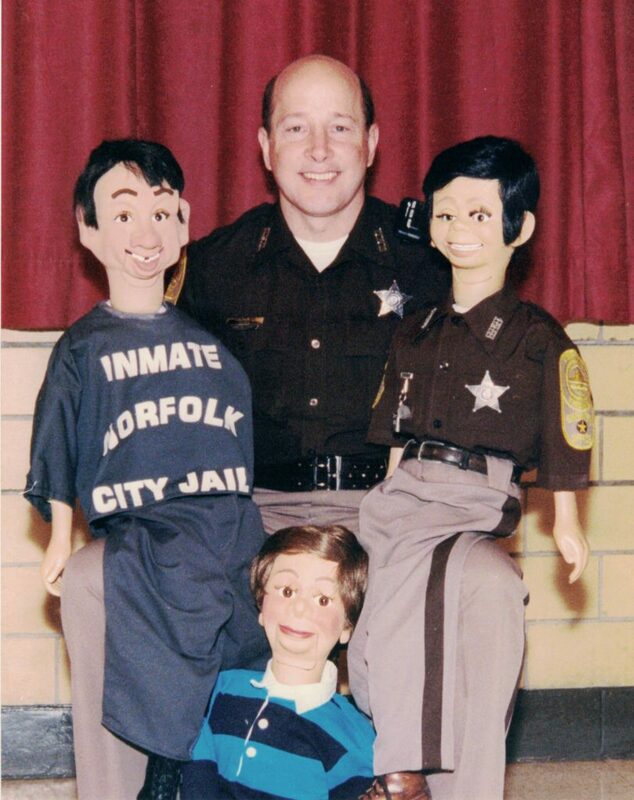 Master Deputy Bob Walsh (Retired) with Inmate Joe, Junior Deputy Matthew and Jeremiah the Student at Lindenwood Elementary School.